The Sealing Wax Palm has brilliant red crownshaft and is rare in North America. In 2011, Planterra sourced these palms for installation at Queen Elizabeth’s Official Canadian Residence, Rideau Hall in Ottawa. Ornamental acclimated tropical foliage is a specialty crop grown for use as houseplants and for commercial interior plantscape installations. These plants are selected and hybridized for specific characteristics, the kind that makes them successful plants to use indoors. 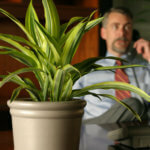 The number of growers who specialize in plantscape grade foliage is small in comparison to other ornamental producers. Their geographic concentration in south Florida makes the supply susceptible to shortages caused by hurricanes. When such shortages occur, Planterra relies on its multigenerational partnerships with growers to prioritize the needs of its customers. Variations in cultivars change over time. These changes include color, variegation, shape, and texture. For projects that require large quantities of a single cultivar, Planterra will contract to grow to ensure the availability. Contract growing typically requires one year in lead time. The arrangements can also be made on an ongoing basis. This specimen Ficus Alii has a wide caliper trunk and interesting looking aerial roots. One of Planterra’s core competencies is sourcing rare and unusual foliage plants for atrium and botanical garden installations. These plants fall into two categories: specimens and rare plants. Specimens are plants which are considered focal points in a design. These one-of-kind plants typically have characteristics such as wide caliper trunks and sculptural shapes. Since these plants are often decades old, the plants are traded and sold among collectors. Planterra maintains is own collection of specimen foliage on display at the Planterra Conservatory in West Bloomfield, Michigan. Planterra regularly trades with collectors and will sell specimens from its collection for special projects. Rare Plants are varieties which are not commonly grown commercially. These are plants that are procured and collected from existing gardens, also known as “plant hunting.” Once collected, the plants are grown and acclimated in a greenhouse or shade house. Planterra does not engage in collecting or moving plants, a practice that is prohibited by law. Speak to a Planterra Expert today!